and look what we got overnight and in to today! It was 2 when I woke up. I think it’s about 6 right now. Degrees. All you really have to do to make it snow is send me out to shovel. It started coming down right after I got in. Planning on taking my new skis from the ski swap to get tuned as soon as the roads look more doable. Every time I hear a car go by I peek out the window nervous about pending disaster. I don’t think it’s time for me to start driving in this just yet! And yes, the flag can stay. We decided not to burn it after all. 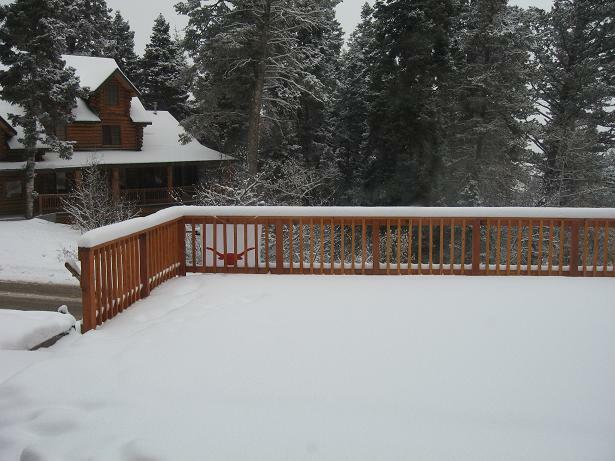 This entry was posted in Park City, Utah, Photos, Skiing. Bookmark the permalink. That patio will be ripe for some major partying in the spring/summer. Is your house a log cabin too?! The house has an awesome deck in the front and an even better one in back. To quote BB “This is a cigar smokin’ yard, not sure if I’d start in the front or in the back”. Both are a major reason we liked it. Hope so! 🙂 Except he’ll have to wait until he can see it again – it’s under 6 feet of snow.